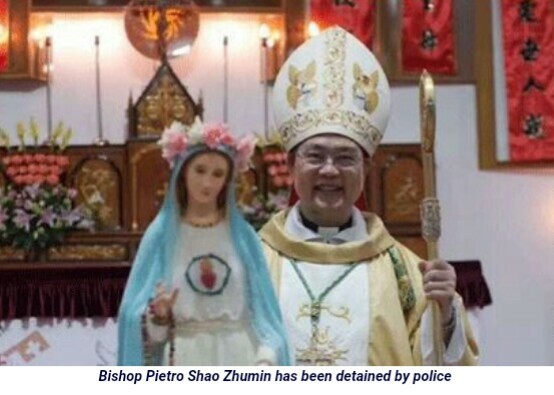 A Catholic news service reports that Bishop Zhumin’s detention was against recent moves by Beijing and the Holy See toward reconciliation, sparking some outrage. Asia News reported that the bishop dropped out of sight several days ago, but gave no details other than saying he had been subjected to “dozens of days of indoctrination as in the times of the Cultural Revolution,” a reference to Mao Zedong’s radical 1966-76 attack on traditional Chinese culture, religion and the intelligentsia. Shao was appointed by the pope in 2016 and posted to the southeastern city of Wenzhou, which has a large Christian community. Officials reached the local religious affairs bureau, a department regulating the Catholic church and police headquarters on Friday by phone, but they said they had no knowledge of Shao’s situation and refused to give their names. Shao’s disappearance follows a breakthrough agreement to give Chinese authority a say over the appointment of bishops that critics called a cave-in to the ruling party just as it is waging a sweeping crackdown on religion. Others characterised it as an imperfect but much-needed step toward uniting Catholics in the world’s most populous country. Such moves are seen as a concession on the Vatican’s part in the face of Beijing’s assertion that it would not allow “foreign forces” to govern the country’s faith groups. Under president and Communist Party leader Xi Jinping, the authorities have in recent months cracked down heavily on Protestants, Catholics, Muslims and Buddhists in the name of national security and the “Sinosization” of religion.